Filament wound = Round, concentric, straight shafts loaded with the greatest potential energy! KINETIXx” IMRT loaded shaft technologies are the worlds only golf club shafts that combine filament winding and table rolling construction methods with a vacuum curing process making Paderson KINETIXx loaded shafts. the most advanced, multi-structure, multi-material, precision tailored high performance composite shafts in the world! KINETIXx IMRT = Visible fiber performance technology unlike any other shaft! The tailored coupling of kevlar and 3K micro carbon fibers, filament wound over precisely located high modulus filament wound and or table rolled flag core sections, in select portions of every KINETIXx IMRT loaded shaft, demonstrate visible kite and dart quadrilateral patterns. Producing a visible rhombus web structure that’s precisely tuned for vibration suppression, vibration control, EI (Energy Inertia), torque, feel and most important, kinetic energy transfer to the clubhead for the moment of impact creating a visible fiber chain that’s comparable to a lightning rod of conductivity. KINETIXx IMRT shafts, are the worlds only filament wound kevlar golf shaft technology family available for all clubs metal woods and irons. 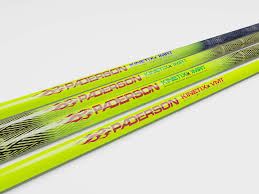 The green or blue kevlar and 3K woven chain of fibers visible in all Paderson KINETIXx IMRT branded shafts have 20x the elastic strength of steel! The fiber revolution has arrived! PADERSON® is also one of only a few golf shaft manufacturers to produce a significant portion of its finished products with materials like structural fabrics and prepreg composites manufactured internally at PADERSON®. PADERSON® today offers a breadth and depth of products and services unmatched in the golf industry. From our state of the art worldwide manufacturing headquarters located in Taichung Taiwan, R.O.C., we manufacture the full spectrum of our advanced materials – this includes everything from carbon fiber and reinforcement fabrics to pre-impregnated materials tailored for use in the robust array of composite products we manufacture. PADERSON® Composite USA functions as the US, International and Asia OEM and premium Aftermarket Sales, Distribution/Fulfillment and Marketing Headquarters of PADERSON®. PADERSON® USA also plays an integral role in support of PADERSON® R&T and R&D divisions specific to the premium composite materials, structures and products PADERSON® manufactures. PADERSON® Palm Desert also serves as the primary product test center for all PADERSON® OEM and premium aftermarket products.